FILE - British-American mountaineer Vanessa O'Brien, right, who holds the Guinness World Record for climbing the Seven Summits in 295 days, receives Pakistani flag from officials during her news conference in Islamabad, Pakistan, June 15, 2017. 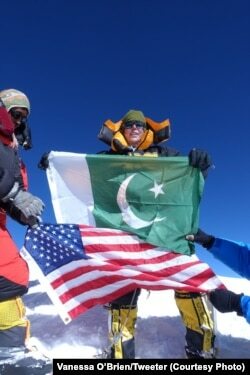 Vanessa O’Brien has become the first American woman to summit K2, the world’s second highest mountain at 8,611 meters. The 52-year-old former banker from New York led a 12-member team of international climbers and planted the U.S. flag on top of K2 on July 28. The mountain is located at Pakistan’s border with China and considered one of the world’s most dangerous peaks for climbers. The first male American team conquered “the savage mountain” 39 years ago. This was O'Brien's third attempt at K2 after having been unsuccessful in 2015 because of unusually harsh weather conditions, and in 2016 when an avalanche swooped in and buried all the expedition equipment stashed at CAMP-3, its high altitude operational base. Bad weather prevented all other international teams from summiting K2 in those two years. It took O’Brien’s team 16 hours from CAMP-4 at 7681 meters to the top, a very long time, but the weather held. She told VOA on Monday after safely descending to K2 base camp at 5,100 meters she was exhausted but very grateful for her team’s success. “This was by far the hardest undertaking I have ever come across. Not just the 50 kilometer winds and snow pushing against you, but the pure blue ice underneath your feet that threatened to pull you off balance at any second,” said the climber, who also holds British nationality. “I was constantly reminded of the 84 people who came before me and lost their lives commemorated at the Gilkey Memorial,” she added. O’Brien was referring to the place near the K2 base camp, where the victims are laid to rest. The Memorial is named after Art Gilkey, the American who died of serious illness during an unsuccessful attempt by his team of mostly U.S. climbers in 1953. “A proud day for #woman everywhere at the top of #K2, the world's second highest mountain,” O’Brien announced via Twitter from shortly after scaling the peak on Friday. “One of the most important flags I carried to the top of #K2 was #Pakistan, a country that has showed me so much love & support #PakistanZindabad (long live Pakistan)," she said in another message on her Twitter post with a picture of the green and white Pakistani flag. Heavy snowfall and unstable weather were again a factor this year and O’Brien’s was the only expedition to reach the top, said Nazir Sabir, the chief organizer of the expedition and veteran Pakistani mountaineer. O'Brien conquered Mt. Everest, the world's highest peak at 8,850 meters, in 2010. But she describes K2 as more challenging and fascinating for mountaineers. “K2 is the perfect triangle. Mountains are not shaped that way. In reality, they are very peculiar and they have got lots of places to rest and go higher and stop. This is boom, a triangle. It is asking for 110 percent effort day one,” O’Brien said. While routine avalanches do pose risks, she says, due to climate change rocks on K2 that used to be fixed to earth and frozen are now just broken and they come down in rock avalanches. “So, you have got the snow avalanches, you have got the rock avalanches, you have got extreme weather and unpredictable weather. Any one of those three could kill the expedition at a moment’s notice. So, it is just fraught with danger and that is probably why for every four of that climb, one dies,” O’Brien noted. Sabir praised O'Brien for her courage, saying that even top Himalayan climbers give up somewhere around second attempt. “I think her determination paid off but we have to understand that there was a brilliant planning behind it. All other six teams gave up and went home while Vanessa and her team were looking for a weather window and it clicked and they used every minute and climbed every inch to the summit,” he told VOA. O’Brien is the 19th woman to have survived the climb to the top. Before undertaking the latest mission, she held the record of being the fastest woman to climb the seven summits, the highest peaks on each of the seven continents. Sabir praised Vanessa as "a friend of Pakistan and a messenger of peace", hoping her repeated visits and successfully summiting K2 will send a positive image of Pakistan and encourage more Americans and international expeditions to visit the country. Militant attacks have in recent years worsened security conditions in Pakistan, discouraging foreigners from visiting the country. But authorities say successes in counterterrorism operations have reduced the threat and improved security.